Our smallest 2.4GHz receiver, the Graupner GR-12 SH+ is a micro, 6 Channel receiver. It is extremely lightweight – only 1.6 g – and its tiny footprint lends itself very well for small indoor flyers or micro flyer. The ultra-low voltage requirements – as low as 2.5 V – allows the GR-12 SH+ to operate on a single-cell LiPo battery making ideal for lightweight setups. This version, however, has an increased sensitivity input, increasing its operational range even further. The GR-12 SH+ can provide a digital SUMH signal on channel 6 as well as direct motor control of a brushed motor (Max 2A) on channel 1. Like all Graupner HoTT receivers the GR-12 SH+ provides telemetry data like temperatures, receiver voltage and signal strength, giving you the information you need for a safe and secure flight. Comes equipped with an SH connector. Great little receiver, ideal for quads. Does even do 8 channels if you use SUMD. Make sure you update FW to enable SUMD. I'm using this receiver in a Crack Pitts. This thing is amazingly small. It works flawlessly and has more range than I will every need. Very good product. Q: Can this Rx be set to produce SUM0, 12 channels? A: This receiver only supports SUMD. Q: Will the connectors of Gr-12SH receiver accept JR-Hitec type servo connector? A: Standard Graupner/JR or Futaba plugs will not in this receiver. For servos we recommend to use our DS121SH or DES 131SH servo. Q: I'd like to use this Rx in some small older fixed wing aircraft. Can I get connectors from you to convert existing servos to fit? A: Yes, you can use part number 33565.1 to convert your existing servo connectors or consider one of our micro servos that already have a compatible connector. 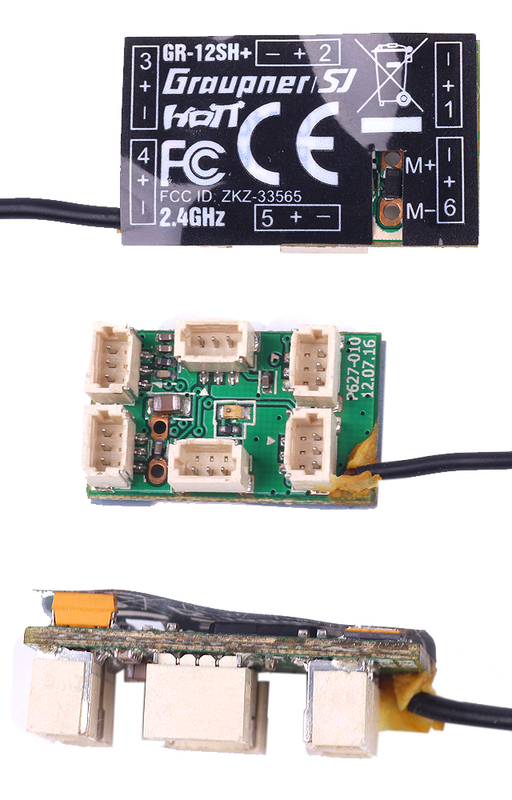 Q: Can this Rx be configured with an MX20 transmitter? A: Sure, like the mz-20 the receiver is a HoTT device so you should be able to bind it. Q: What plug type does this reciever require? A: The plug is called SH. We have a few micro servos that have an SH plug that fit in the RX socket or you can buy also SH to JR cables from our site. Q: Which transmitters does this receiver work with? Bob. A: It will work with any Graupner HoTT radio.